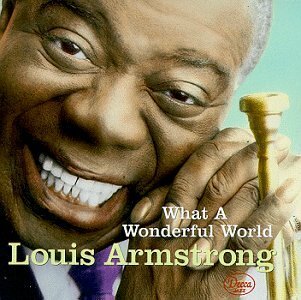 « What a Wonderful World » is a song written by Bob Thiele (as « George Douglas ») and George David Weiss. It was first recorded by Louis Armstrong and released as a single in 1968. Thiele and Weiss were both prominent in the music world. Armstrong’s recording was inducted in the Grammy Hall of Fame in 1999. The publishing for this song is controlled by Memory Lane Music Group, Carlin Music Corp., and Bug Music, Inc. The song was initially offered to Tony Bennett, who turned it down. Thereafter, it was offered to Louis Armstrong. The song was not initially a hit in the United States, where it sold fewer than 1,000 copies because the head of ABC Records did not like the song and so did not promote it, but was a major success in the United Kingdom, reaching number one on the UK Singles Chart. In the US, the song hit #116 on the Billboard Bubbling Under Chart. It was also the biggest-selling single of 1968 in the UK where it was among the last pop singles issued by HMV Records before becoming an exclusive classical music label. The song made Louis Armstrong the oldest male to top the chart, at sixty-six years and ten months old. Armstrong’s record was broken in 2009 when a cover version of « Islands in the Stream » recorded for Comic Relief — which included 68-year-old Tom Jones — reached number one.ABC Records’ European distributor EMI forced ABC to issue a What A Wonderful World album in 1968 (catalogue number ABCS-650) which did not chart in the US due to ABC’s non-promotion of it,but did chart in the UK where it was issued by Stateside Records with catalogue number SSL 10247 and peaked on the British chart at #37.The song gradually became something of a standard and reached a new level of popularity. In 1988, Louis Armstrong’s 1968 recording was featured in the film Good Morning, Vietnam and was re-released as a single, hitting #32 on the US Billboard Hot 100 chart in February 1988. The single charted at number one for the fortnight ending June 27, 1988 on the Australian chart. In 2001, rappers Ghostface Killah, Raekwon and The Alchemist released « The Forest, » a song which begins with three lines of lyric adapted from « What a Wonderful World », altered to become « an invitation to get high » on marijuana. The rappers and their record company, Sony Music Entertainment, were sued by the owners of « What a Wonderful World, » Abilene Music. The suit was thrown out of court after judge Gerard E. Lynch determined that the altered lyric was indisputably a parody, transforming the uplifting original message to a new one with a darker nature. What a Wonderful World (de l’anglais signifiant littéralement « Quel monde merveilleux ») est une chanson de Bob Thiele et George David Weiss, enregistrée pour la première fois par Louis Armstrong et sortie sous forme de single au début de l’automne 1967. Elle a fait l’objet de nombreuses reprises. Dans les paroles, le narrateur décrit à la première personne les différentes choses de la vie quotidienne qu’il voit, et considère comme belles (les arbres et les roses, le ciel, la lumière du jour et la noirceur de la nuit, les couleurs de l’arc-en-ciel, les bébés qui grandissent et représentent l’avenir) avant de conclure avec optimisme, dans un refrain qui donne son titre à la chanson : « and I think to myself, what a wonderful world » (« et je pense en moi-même, quel monde merveilleux »). En 1993, Israel Kamakawiwo`ole en a réalisé un medley avec Over the Rainbow : Over the Rainbow / What a Wonderful World. La reprise « punk » de Joey Ramone a été utilisée pour des publicités en France, et figure dans la bande originale de la comédie française Moi, Michel G, Milliardaire, Maître du monde. À noter que cette chanson fut un succès au printemps 1968 (n°1 au hit-parade de la BBC) puis popularisée à nouveau vingt ans plus tard par le film Good Morning, Vietnam.